The White-Breasted Nuthatch is a cute and quirky bird that can be found at bird feeders year round. 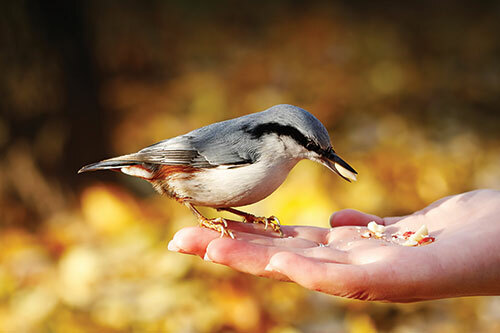 This trusting bird may even eat out of your hand if it gets to know you! The White-breasted Nuthatch (Sitta carolinensis) is an active and nimble North American songbird who is a very common visitor of backyard bird feeders. American Expedition is proud to present information, interesting facts, and photos of the White-breasted Nuthatch. 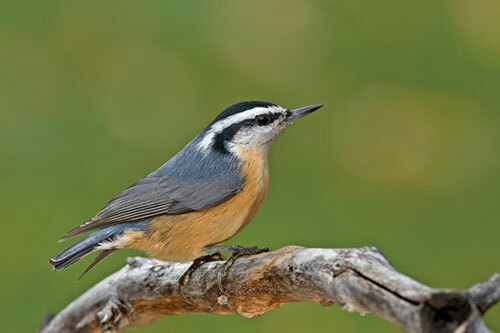 Although White-breasted Nuthatches are the largest type of nuthatch, they are quite small compared to other species of birds. They measure between 5-6 inches long and have a wingspan of up to 11 inches. They weigh only about one ounce. The nuthatch has a grayish-blue back and wings with a black “crown” on the top of the head. They have a white breast, belly, and face. Their tail feathers are not very long, and their long beak is slightly upturned. The lower belly under the tail feathers is a chestnut color. The male and female are very much alike, only the female is lighter in color. Looking for Bird Houses? 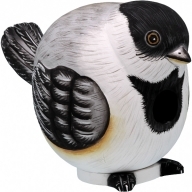 Find themed Bird Houses in our wildlife store. 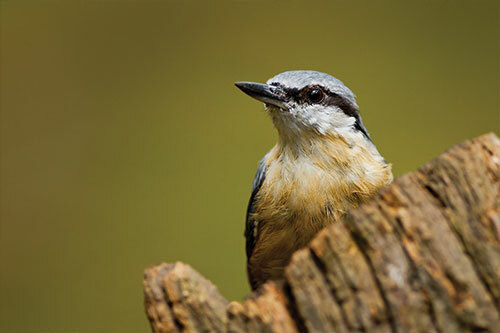 The female nuthatch builds the nest on her own with bark, fir, and dirt in tree cavities. Nuthatches will sometimes use nest boxes. In late April, the female will lay five to nine eggs that are cream colored with red speckles. The female incubates these eggs for 14 days until they hatch. When the chicks hatch, they are naked and helpless. Both the male and the female feed the chicks until they are ready to fly. They then leave the nest and search for their own territory. White-breasted Nuthatches have very loud voices. Nuthatches get their name from the way they crack open seeds. 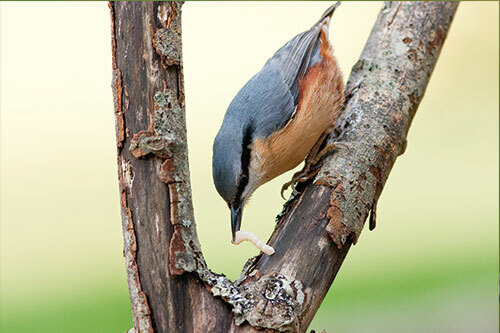 Nuthatches jam their seeds and nuts into tree bark, and then will whack them with their beak to bear them open. White-breasted nuthatches are the most popular type of nuthatch in North America. Nuthatches produce one brood each season. A nuthatch’s call is made of short “inh” notes. Nuthatches live in pairs year-round. Populations of this nuthatches are stable. White-breasted Nuthatches reside in most of the United States and parts of Canada and Mexico. 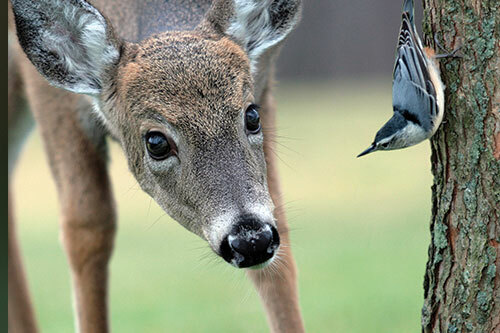 These birds are year-round residents of their area. They live in forests, on forest edges and open areas where food is available. Interested in Bird Feeders? 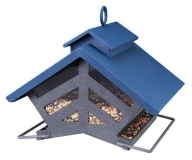 Find unique Bird Feeders in our wildlife store. 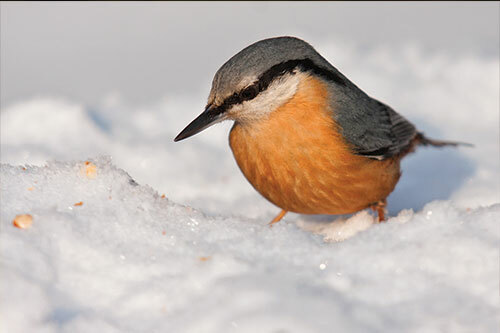 A Nuthatch’s diet consists of insects, ants, larvae, acorns and seeds. These birds forage on tree trunks, going up and down looking for bugs in the bark. They are big fans of backyard bird feed as well! Shop for Wild Bird gifts in our wildlife store. Nuthatches are curious birds. If they grow comfortable with you, you can feed them from your hand! The quirky nuthatch seems to enchant all who come into contact with it. Nuthatches are year round residents of their range. 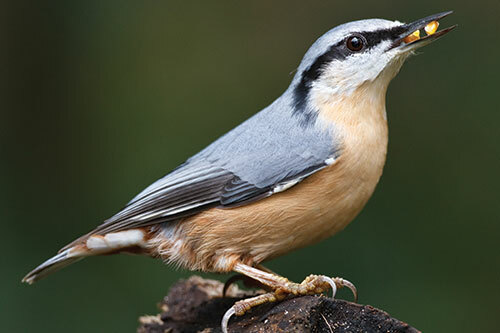 A Nuthatch’s diet consists of insects, ants, larvae, acorns and seeds. Interested in Birding Supplies? Visit the Birding section of our wildlife store!